This morning I wore a red shirt to the gym in honor of Day 1 of CHD awareness week. I had a goal to run a mile nonstop. I need to get back into daily workouts, I need to lose two sizes. I stepped on determined. As I began my session on the treadmill, I tried to envision great power running through my clumsy legs. I managed to maintain a slow pace, and not much else. My breathing became erratic. The controlled inhales and exhales were becoming jagged and the rhythm difficult. As I struggled to keep up with my goal of running a mile nonstop it hit me. This is what If feels like to be Izzie. Running, trying to keep up with a circulatory system that doesn’t match the desire to run, play and be a toddler. She stops to catch her breath from time to time. For her, it’s normal. As her mother, I know it’s not. 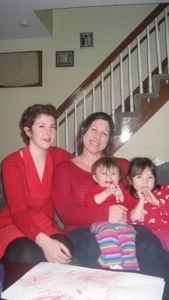 I wore red today for her and for countless others affected by congenital heart disease. It is a terrible, terrible disease that can strike without warning, and with no reason. It has taken beautiful children I came to know and love on Facebook. Robbed their parents of the opportunity to raise them and ripping their own hearts out in the process. As I went through my day thinking of these precious babies, I saw red on my fellow heart mamas walls. My heart lifted with the support I could they were getting and the. I saw my own. Words cannot express how grateful we are to all our friends and family for the simple gesture of putting on a red piece of clothing today. In a world whose focus isn’t so much on children’s’ illnesses, it lifts us up when you show us that you have our back. You know it’s hard. You understand what is at stake. And you care. I could not believe the people who wore red for us and at the end if the day, to hear that Massachusetts has proclaimed this week to be the official Congenital Heart Disease week was awesome. Especially since it was proclaimed in honor of an amazing little guy named Joey who passed away very unexpectedly last year. The Heartland was never a place I saw myself being in. I didn’t really know it existed. I couldn’t be here without any of your support. My strength that people have told me that I possess, comes from all of you. Thank you from all of us for standing with us today!